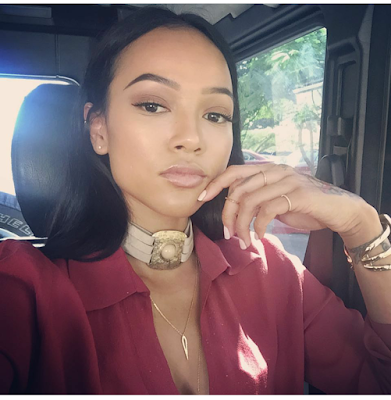 Few people can make the transition from being a famous celebrity's girlfriend to being your own self made woman look as easy as Karrueche Tran. Since splitting with singer Chris Brown she's turned her life around (it seems for the better) and now she's booking TV shows, movies and making appearances hosting in store events. Not bad right? So what's next on her operation image makeover? Being a humanirtarian of course! Here's my only gripe- when these celebrities visit Africa they tend to show one side of the continent. Yes visiting orphanages is important but it would be so refreshing for K to show a balanced side of Abuja to her followers. For some of them this is the closest they will get to seeing Nigeria, this could be a great"teach-able moment"
Karrueche is also catching major heat for the outfit she wore to visit the orphanages in Nigeria. Is it too short? Is she flashing her luxurious life? Nope I don't think so. Folks on Instagram complain about any ole thing!